Eat This, De Beers! | OhGizmo! By David Ponce on 04/03/06 • Leave a comment! Hah! Diamonds are so for rich dudes who drive Mercs and talk about stocks, bonds and mergers and acquisitions. 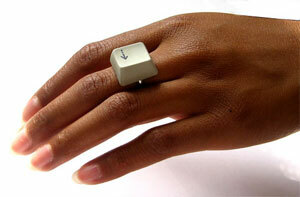 You wanna pop the big one, while letting your lady know just what kind of fine dude you are, make sure to get this funky geek ring, from AZERTY Objects. No word on price, but if this doesn’t say: “I might serenade you with some code…”, I don’t know what does. You can place an order through email, at “AZERTY” at “DEZZIE” dot net.